Global manufacturing facilities follow cGMP (21CFR820), ISO (9001:2008) and ISO (13485:2012) regulatory protocols to ensure a consistent, reliable and uninterrupted supply of your powder and liquid buffers in your preferred packaging. Whether you need a standard off-the-shelf buffer or a customized solution ,Lonza | Sartorius has an experienced team to guide your selection and development. Our offering also covers a wide range of applications including cleaning, transport and fill & finish. Single-use mixing bags desgined for applications such as buffer and media preparation, product formulation and reformulation, viral inactivation or the dissolution of powders. Bags with integrated magnetic impeller assembly are available for maximum flexibility and performance. 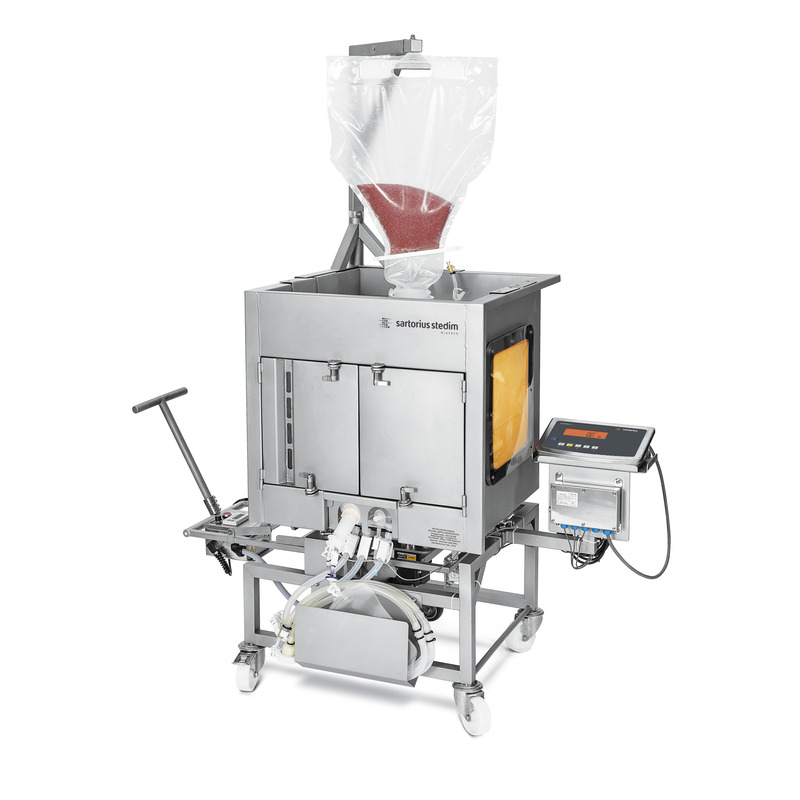 Sartorius Stedim Biotech single-use mixing bags can be ordered in volumes from 50 l to 1,000 l.
Sterile empty powder transfer bags are available for powder-delivery applications. Either you are looking for a standard formulation including WFI (water for injection-quality water) or a fully custom downstream product we can manufacture any formulation to meet your specific needs when it comes to downstream processing steps. Buffer needs and volumes can become very large as processes grow and Sartorius Lonza is well equipped to work with you on minimizing the burden associated with transport logistics. We offer an extensive array of downstream processing buffers for protein, cellular, and viral-based therapeutics. Appropriate for the techniques you perform and for each steps of your techniques. The process begins with approved and specified raw materials obtained from qualified vendors. Our insistence on superior-quality materials includes complete NAO (non-animal origin) traceability. Our buffer and Water for Injection (WFI) production systems meet both US and European Pharmacopoeia standards. Standard testing on finished products includes tests for sterility, osmolality, pH, and endotoxin content. Our Water For Injection (WFI) products are manufactured and tested according to strict industry standards. It meets or exceeds USP and EP requirements. Use for in vitro diagnostic procedures has not been established, this product is manufactured aseptically under cGMP 21CFR820 conditions by a validated sterile filtration method. Our Water For Injection (WFI) can be used for media & buffer preparation, hydration, cleaning, washing, rinsing of filters or equipment.